A couple of months ago I donated a copy of my Kids’ Craft Book and a “craft session” to out charity auction at school. Finally, the family that bid for it and ours where all free to get together and get crafty. 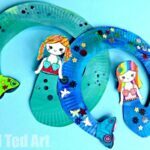 As the kids were all different ages, I wanted to choose a craft they could all enjoy – we had a 9yrs old, 6yrs old, 5yrs old and 4yrs old crafting. 2 girls and 2 boys. I decided on Paper Plate Dream Catchers. To make it a little cuter/ quirkier I added a little heart / star to the centre (this dream catcher I saw a while ago, gave me the idea to add the little heart detail!). We still had plenty of paper plates from our paper plate crafts hangout and I just had a new batch of wool in, so thought these would be perfect. It was interesting to see how the different ages did. I am so used to what MY TWO kids are able to do, that I often forget that they are sometimes a little “ahead” of their peers, simply, because we do so much. 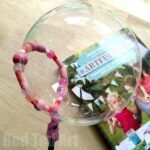 Pip Squeak (aged 4), managed the threading part of this activity as well as the 9yrs old! I was rather taken aback! First published in April 2014 and republished for your convenience! 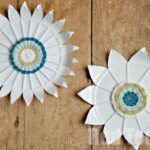 1) Begin by cutting out a circle from the centre of your paper plate. 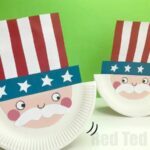 Try and keep the bit you cut out “whole”, because you can then reuse part of of the paper plate to cut out a heart or star shape. Note – the hearts were MUCH easier to thread, in retrospect the stars where fiddlier and a bit more of a challenge (poor boys!). 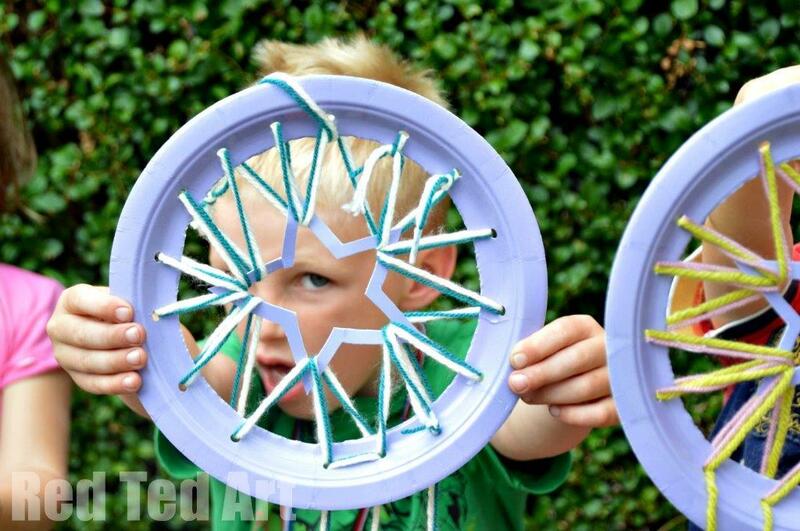 Take a hole punch and cut even holes into your the rim ofyour paper plate dream catcher. I started by making a hole on opposite sides, then rotating by 90 degrees and punching two more olds – a bit like a compass. Then fill the spaces in between evenly. 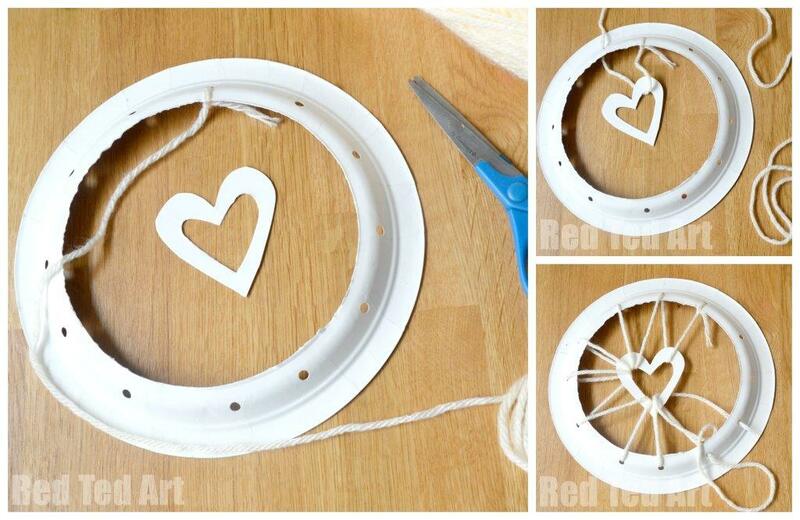 We made 12 – 16 holes likes this – forming the rim of your paper plate dream catcher. 2) Cut some wool – it needs to be quite long.. but that also means it is more likely to get tangled. So if working with younger kids, shorter pieces are recommended. You will just end up with a couple more knots, but I don’t think that that is a problem. Knot your wool to one hole and then lace it through the heart and then the next hole along. Always lace in the same direction – e.g. over the heart and under the hole. Don’t pull the thread too tight. Keep it loose (approx 4-5cm), you get towards the end it will naturally tighten. Alternatives: you can also thread some beads along your thread as you go along. It looks very pretty to haev beads “in” your dream catcher too! 3) If you wish repeat with a second colour or third! 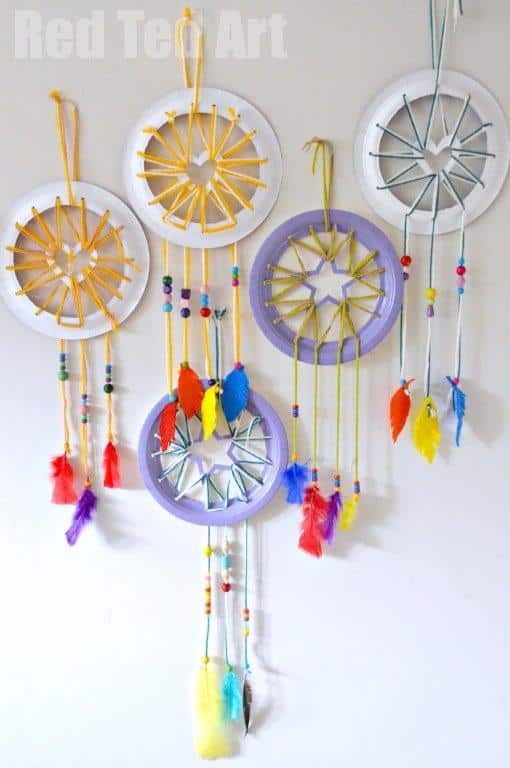 and make a really colourful Paper Plate Dream Catcher! TOP TIP: if working with younger kids, you may choose to thread TWO pieces of wool through your paper plate dream catcher in one go. Or just choose one colour. Kids do loose concetrations. 4) Now it is time to make your “dangly bits”. 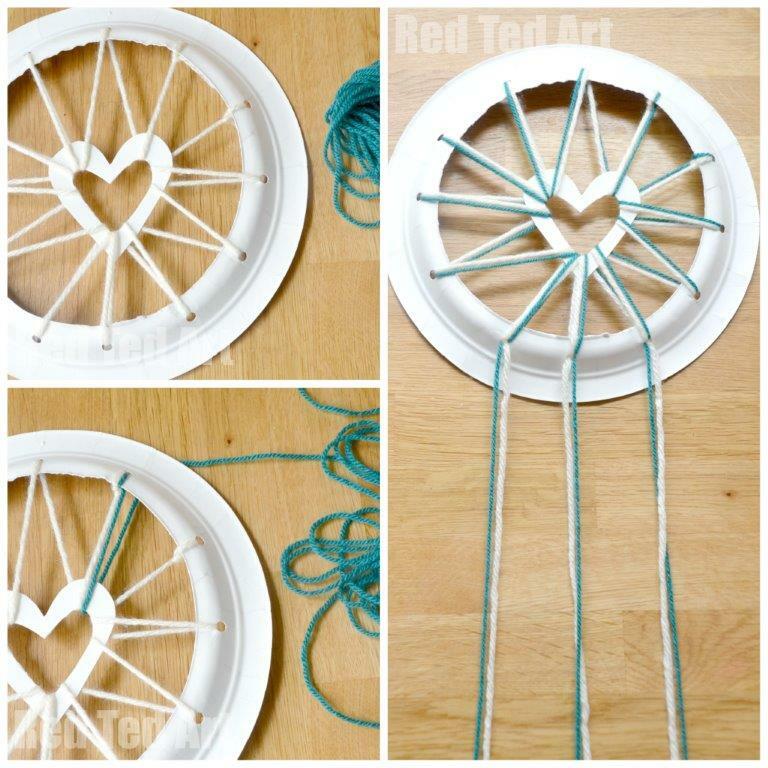 Thread some more wool through the bottom 3-4 holes of your dream catcher. Tie at the back. Again use tape at the bottom of your wool for thread. 5) Bead on your beads. As our wool is quite thick, we litterally just added the beads and the thickness of the wool held them in place where we wanted them. 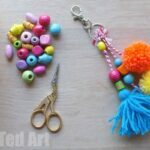 If need be, add some little knots under the beads to keep them in place. 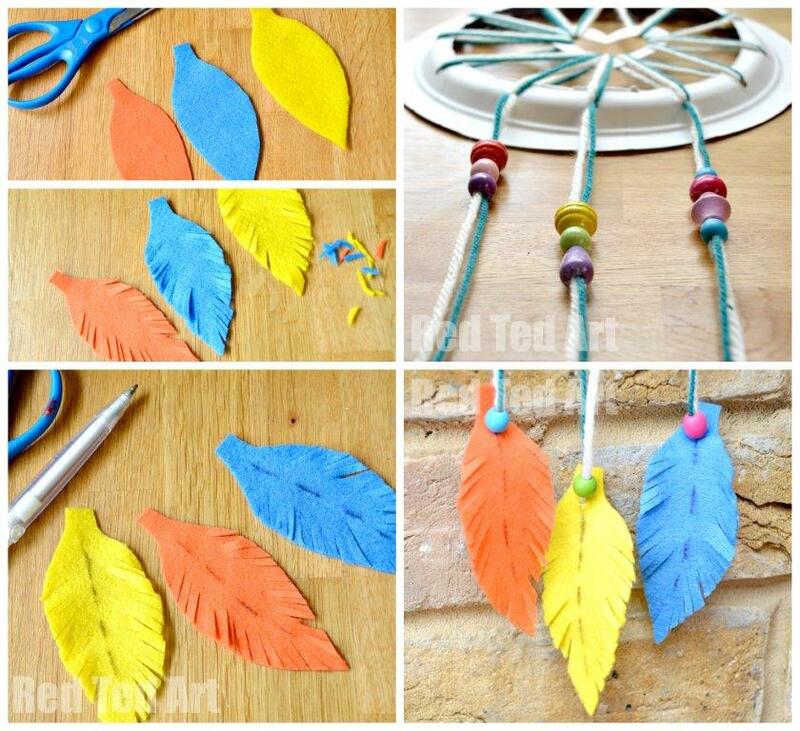 6) Either use natural feathers for the bottom part of youer paper plate dream catcher or make some out of felt. 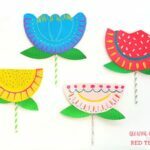 The felt feathers are SUPER EASY to make – simply cut a leave shape in the desired colours – snip some uhm snips into the side of the leafe and add a little line with a biro – and done, you have some felt feathers in fantastic colours. 7) Snip a tiny hole at the top of your feather. Thread a bead and then your feather and tie a knot at the back. For the real feathers, we just tied the wool around the end of the feather and “hid” the knot with a bead. 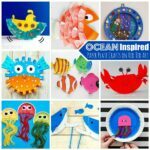 Your paper plate dream catchers are now finished!!! 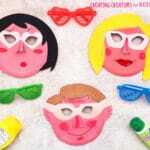 I love how this craft brought both boys and girls together and how they all enjoyed it on different levels. I did have to help the boys a little more with their threading skills, but they did a great job and it was great practice! 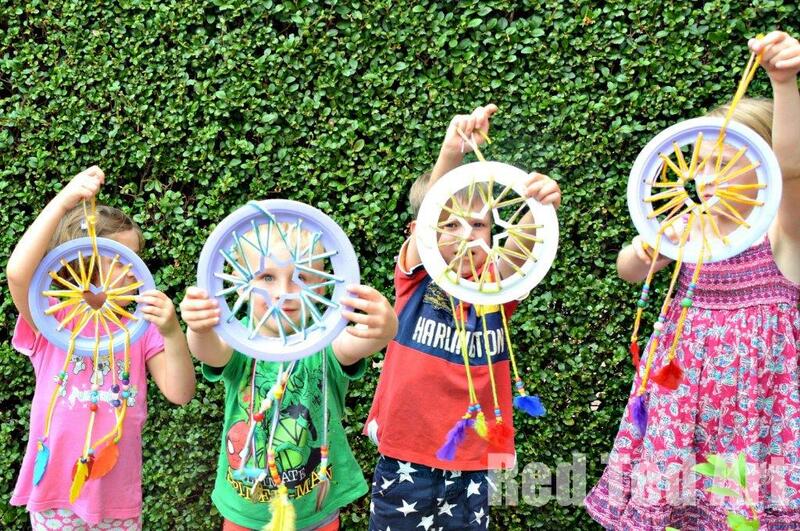 I think they love their Paper Plate Dream Catchers.. and all four got hung up in their bedrooms that night! Going to try this today with my 3 and 4 year olds. I’ll let you know how it goes. Thank you for your ideas. I haven’t got a video for this (yet) sorry!